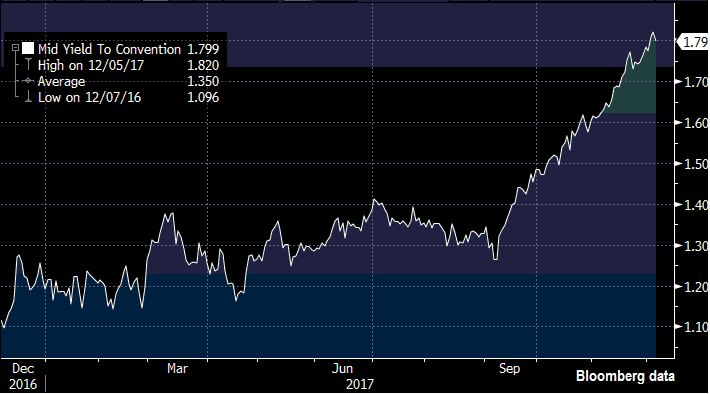 It was the highest of yields, it was the lowest of yields, it was the age of up up up, it was the age of down down down, “it was the epoch of belief, it was the epoch of incredulity”*. The two bonds of this particular tale are the 2-year U.S. Government Treasury and the 30-year U.S. Government Treasury. Dissimilar as they may be, their yields are getting closer and closer. 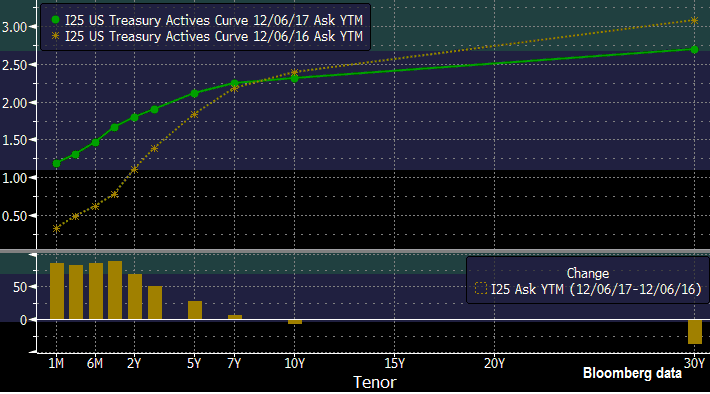 You may have heard that the U.S. yield curve is flattening, but sometimes it’s helpful to see it in pictures. 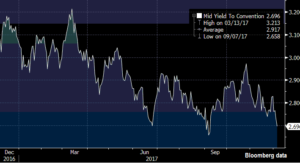 If the Federal Reserve Board (the Fed) raises the federal funds rate four or five more times over the next 15 months, the 2-year yield could easily approach the 30-year yield. Graph 1: From 12/6/16 to 12/6/17, the 2-year yield rose appreciably from 1.11% to 1.8%. Graph 2: From 12/6/16 to 12/6/17, the 30-year yield dropped 0.37% or 37 bps. 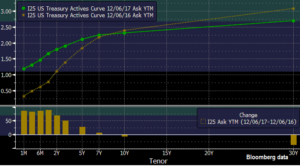 Graph 3: Put them together, and you have significant yield curve flattening of 1.06% between the 2-year and the 30 year. * Charles Dickens, A Tale of Two Cities, chapter 1, page 1, 1859.